Things nautical are perennially stylish. Or at least they are never really fashionable, and so, don’t go out of fashion. One of the best pieces of kit out there is the fisherman’s sweater, either an Irish Aran Sweater, or a Norwegian number like that worn by Hem, in the photo above. Ruggedly handsome, they are also built to take the weather. Why write about a bulky, handmade sweater today? I’ve just returned from our Irish festival (no, I’m not, except for one day a year when Guinness is in plentiful supply.) Yesterday, the temperatures soared to 80ºF. Today we are expected to top out at a brisk 54 sometime around 3 PM. Which was as good an excuse as any to lug out the cable-stitched turtleneck, Donegal tweed flat cap and Barbour jacket. The classic French-vanilla coloured sweaters (which are really the invention of the early part of the 20th century when modern production methods were introduced in the Aran Islands) work well with jeans or brown and cream herringbone tweed trousers. Since they are a little bit oily — if you get a real one — they will shed some dew (although Guinness can leave a bit of a stain and at any rate, you will eventually wind up smeeling a bit like wet sheep…) and allow you to stay toasty, dry and well-dressed. And they’re not only for men. A particularly fashionable young woman I knew wore one to our croquet party with winter white trousers. While the rest of us shivered in our linens and cotton tennis sweaters, she remained unaffected by the drizzle and damp. Layer a technical fabric, long-sleeved t-shirt underneath and breeze through the next, too-early-in-the-spring, garden party. The darker varieties always work well with jeans or cords, with blue being the most versatile colour in my opinion. I have worn mine with darker greenish brown whip-cord trousers (or olive wide-wale corduroys) and a brown leather jacket to great effect. With a dark brown trilby and a good pair of ankle boots, you are ready for travel and dinner at a casual bistro upon arrival. Or a $5 bowl of shepherd’s pie and an equally expensive plastic cup of Guinness at the street festival. Now I really know why Irish eyes are smilin’. This entry was posted in Elegantology and tagged casual clothing, Elegantology. Bookmark the permalink. 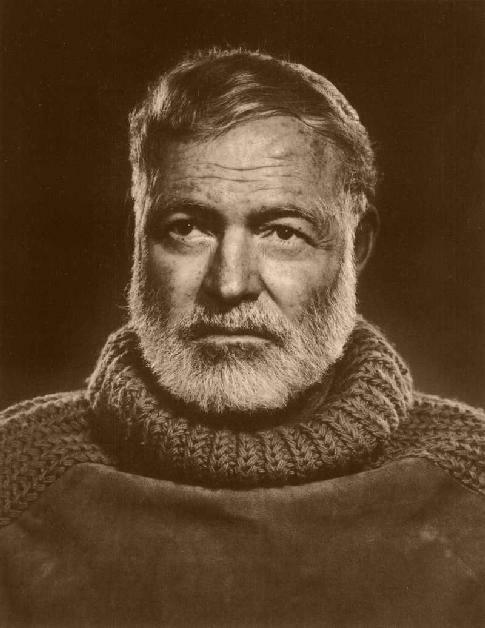 Hemingway twice in a row? I love it! If you don’t mind requests, how about a cooking/entertaining post entitled “The Old Man and the Pea”? I have one of these as well! Picked it up for 40p from some gran at a car boot sale. deal of the century, i’d venture. Hi Nick, Spring always does that to me. It’s when I re-read “The Sun Also Rises” and watch “Brideshead Revisted” for the ump-teenth time. Hmmm, will have to work on a Papa/Pea post…. Hiya Fairfax, yes it was the deal of the century. I picked mine up at Marshall’s a few years back and it’s starting to come apart at the seams… “Made in England” — serves me right. Nice post and ALWAY in style…classics always are. Hello Ms. H, “you can’t go home again.” That’s the trouble with wanting to be fashionable. For some of the real red hot tabasco (though not fisherman’s sweaters) head to Filson’s and JL Powell. I need to find this sweater!! Help. Please send info on where to find to gerritstan@yahoo.com.